My Mother in Law is back in New York so I’m on my own for Turn on the Oven Tuesday. 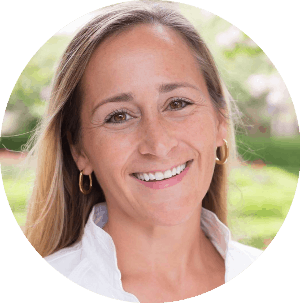 The idea is to cook something new for my kids each week, and show them that my oven and range really do work. Looking back over the last few weeks, it seems that this should be called Turn on the Range Tuesday, because I have not used the oven on time. This week is no exception. This week I made vegetable curry with cauliflower rice. The curry is something we’ve made a million times, but the cauliflower rice is something new. 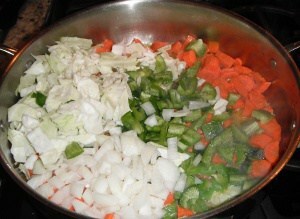 I let the veggies cook for about 10 minutes, on low heat. Once tender, I added 5 cups of water and the curry mix. I use the mild Japanese style curry found in the international food aisle at Fiesta. 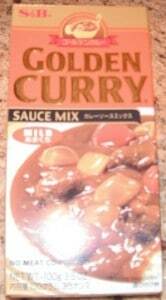 The curry mix is solid and dissolves in the boiling water. Stir it and let the curry sauce thicken on low heat. While this cooking, I started the cauliflower rice. More information can be found HERE. 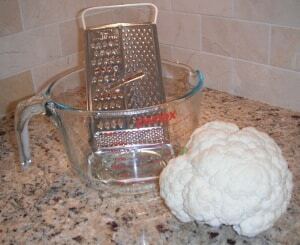 I used one head of raw cauliflower and shredded it by hand. It took a little time, but was easy to do. One head made about 4 cups of rice. Next time I’ll use two heads of cauliflower. 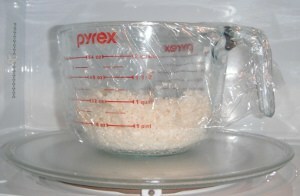 I then covered the rice with plastic wrap and put in the microwave for 5 minutes. No water is needed. After 5 minutes, the cauliflower rice was fluffy, so I declared it done. The curry and veggies went on top of the rice and was delicious. The cauliflower had the same texture as rice and my kids did not know the difference. I think we’ll use cauliflower for rice from now on. Vote Today! Polls are open until 7 pm.